It must have been clear to SSG Limited that all was not well with the zombie in the late 1970s, and so a further machine-printable figure was designed - the lightweight. The 1981 catalogue devotes a page to this new figure, which it states was test marketed in various regions of the UK before its general release. 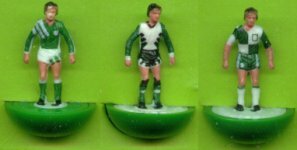 It is worth noting that the C174 World Cup Winners pack, which only appears in the 1980 catalogue is made up of lightweight teams. There is also a machine printed version of the 1970s West Ham (209) which appears in the 1980 FA Cup final pack, but not in the 1981 catalogue. This arrival date is very important because 1980 is the final year (in the UK anyway) that all numbers were still in the team range. 1981 saw the first wholesale removal of kits that no longer had teams associated with them. What this all means for the lightweight is that theoretically all references numbers could have been produced in this figure. Given that the zombie does not appear to have been produced in every reference, it seemed likely that a lightweight would not exist for all of the teams phased out between the 1980 and 1981 catalogues. This lack of l/w would be even more likely for colours that no longer had teams attached to them. It would be odd for there to be much demand for a ref 54 or a 69 for example, which had been blank since the early 1970s. Even if these had been requested, SSG may well have had unsold heavyweights to send out. The long disused reference 43 was still produced as a l/w in 1980. The normal boxes of the lightweight era are shown above. The single-player window box is shared with the heavyweight and the zombie. A few of these earlier teams can turn up in the large 1980s boxes, but this isn't a regular occurrence. I've not illustrated the squad boxes, super team, or Premiership boxes here. So please see the Team boxes Appendix for more details. Although the lightweight was introduced as a player to be machine printed, like zombies, these figures were also hand-painted. This practice was widespread in the early years of the figure, but slowly died out. Hand-painting may also last longer in production based outside the UK. The Italian catalogues do show hand-painted versions of teams that only seem to appear as a print in the UK. It is not easy to find out exactly how many of the teams were produced as hand-painted lightweights, but it is probably a very large number of the early references (i.e. up to 328). These teams were inherited from earlier figures, and many would have been selling in small numbers by this time. So the extra task of producing a print would not have been worthwhile, especially where the kit was distinctive. Even the teams that do get a machine-print often turn up hand-painted in the first couple of years of lightweight production. Perhaps this was due to demand exceeding the capacity of the machines. Teams introduced from 1981 onwards are more likely to be designed as a machine print, but some kits seem to avoid this. In 1982 Waddingtons changed the way Subbuteo teams were sold in the UK. Toy shops were now only offered the top 100 teams, whilst the remainder (another 200+ teams) had to be requested directly from Waddingtons (either the retailer or the consumer could do this). Some small UK teams (i.e. 366 Grimsby Town) went straight into the "request only" list, and these are often the teams that seem to only have a hand-painted version. However, there are exceptions. Southampton away (367) was in the top 100, but still seems to be hand-painted only. This shop stock range of teams was further reduced to 75 teams by 1985. The 1986 catalogue still featured 298 teams, but this was reduced to 167 the following year. I suspect that this cut-back also deliberately put a stop to any remaining hand-painted teams. That said, Waddingtons had to keep some painters for the accessory range, and a couple of hand-paints may have slipped the net for a few years. I expect to be proved wrong, but the final hand-painted team (by quite a margin) seems to be 633 Reading, which was introduced in 1986 and ran until 1989. This replaced the 532 Reading (1984-85) which itself was a late introduction to the hand-painted ranks. As mentioned above, the lightweight was designed to be machine printed. These prints allowed fine details, and were at their best when coping with the craze for pin stripes in the early 1980s. The Hasbro era teams with advertising logos and other small badges were also often very nicely done. Sadly, I'm not aware of the actual technique that was used to produce the machine printed teams, but "transfer tablets" have been mentioned. What I find interesting (and everyone else may find dull) are the printed patterns that appear across the range. We see this happening with machine printed zombies too. The team prints seem to split into two distinct categories. There are kits that are an accurate representation of a single team, and there are the kits that are more generic. The teams in this second category are the ones that stay in the range for years, and are also the ones that have similar patterns. I think I'm waffling, so lets look at some examples. The earliest and most widespread stripe pattern consists of three thin stripes on the body, and a round collar. This has always reminded me of the wicket in cricket. The arms also have stripes, but these do not touch the "wicket". This matches the way stripes were usually painted onto heavyweights. The pattern stays on some of the old teams into the early 1990s. In the mid 1990s the striped teams seem to be split into two different patterns - "thick" stripes, and "gate" stripes. This is a pattern with thick stripes and a V-neck. They actually appear to start in 1983 independent of the wicket striped teams, with ref 457 Argentina, and 464 West Bromwich Albion. However, in the late 1990s it takes over from the wicket stripes on references 3, 4, 30, 36, 52, 424 and 440. It also replaces the very thin stripes on 487 (Brighton) and 632 (Galatasaray) as well as appearing on new kits like 737 (Botofogo) and 798 (Talleres De Cordoba). This was the other major 1990s standard stripe pattern. It has three thin stripes like the wicket pattern, but there is no round collar and the sleeve stripes curve inward to form the top of the body pattern. I think it looks like an imposing gate, but I might be mad... so if anyone has a better suggestion for a name for this pattern, then please tell me. These stripes replace the wicket ones on teams 57, 58, 64, 76, and 95. They also appear on the late version of 579 (Juventus), the second version of 731 (Plymouth) and on 766 (Borussia M'Gladbach). This is another late 1990s stripe pattern, that gets used on 501 (final version), 278 (final version) and also the Melchester Rovers at 806. In the 1980s the hoops are thin, but Celtic (25) and Sporting Lisbon (277) both swap to thicker hoops in the 1990s. The 1980s teams with trim have round collars, but the 1990s versions have v-necks. The same switch to v-necks also applies to teams with sleeve trim. The various advertising marks (especially Adidas ones) are also repeated across the range in the late 1990s. Other Design changes on Machine Painted Teams. 727 Newcastle (first version) with long and short sleeves. It is difficult to know how many different variations in team colours exist. Fellow website owner Stewart Hannah quoted to me that "nearly 1200 different transfer tablets" were produced for printing onto teams. This figure seems high compared with the number of teams currently illustrated, but new prints seem to turn up all the time - usually when a collector picks up some spares to complete a team, and finds they don't match. Now, designs for the smaller clubs might only have had a run of 1000 or so boxed teams produced, and so the teams would all be identical. This also seems to be the case for most of the big clubs when the kit only stays in the range for a couple of years before being updated. It's usually were a team stays in the catalogues for years that you get variations. I'm not sure whether this was for a technical reason (i.e. did the old tablets wear out? ), or whether the kits were just reviewed periodically. Either way, teams who look the same year after year in the catalogues can have very different sides in the boxes. A good example would be Sampdoria (398), which has at least four different versions. Mind you, even some shorter lived teams end up with variations. The 727 Newcastle illustrated above is a good example. The original version of this kit is in the catalogues from 1991 to 1993 before being replaced, but there are still two different versions. The long sleeved version has the black printed straight onto the white figure, whereas the short sleeved one has white stripes printed onto the black. Most weird. Another team with two different prints is the first short-sleeved version of the Republic of Ireland (699) - produced 1990-93. Tracking variations in the prints is actually half the fun of collecting lightweights. The lightweight era seems stocked to the brim with anomalies. Numbers that didn't make the catalogues. In the lightweight era team kits change so fast that there are gaps in the number ranges between catalogues. I own a catalogue for every year from 1981 to 1986, and yet most of the numbers between 401 and 440 do not appear in any of them. Other numbers were allocated, but never released (i.e. 580-592 which were to be MISL teams if interest in the US had warranted it). Others don't appear in the British catalogues, but do appear elsewhere (like 474 Karlsruher in the 1982-83 Italian catalogue). At present the list is short of around forty numbers, and I'm not sure whether teams were produced on them all. For the record these are 349, 395, 396, 406-409, 411, 413-414, 417-421, 426-430, 432, 434-438, 491, 505, 510-512, 575-576, 646, 656, 661-662, 678, 697, 756, 757. In 1981 the range goes to 359, but the catalogue also contains numbers 501-509. A year later, while the 400s are being utilised, the NASL teams are given the numbers 540-560. Again, this gap is filled at a later date. In addition, numbers 404, 405 and 415 don't appear in 1983, when the range passes 400, but they do appear on the 1985 poster. As with the heavyweights, there are no set base colours for lightweight kits, and variations occur. However, the lightweight players are not glued into their bases, so if you want to change a team to a nicer colour, you can with relative ease. As far as base lettering goes on lightweights, there are only two versions. The 1980s base is identical to the final Zombie base, and has the word SUBBUTEO in caps. In the early 1990s, this changes to Subbuteo in small letters (which looks much nicer). Teams that survive to the late 1990's can have the one colour/one piece hasbro base on a standard lightweight figure. As a rule, it is teams available in 1996 or later that have Hasbro based versions. This also means that any teams issued after 1996 are only available on Hasbro bases. In the early 1990s, with away kits changing on a yearly basis, and Subbuteo numbering up in the 700s, Waddingtons (and Hasbro) gave up giving each new kit a new number in the range, and started re-issuing kits on the same numbers - for example there are four different Arsenal away kits on number 743. In the mid 1990s Waddingtons added 63 to the start of the team numbers, but otherwise continue to use the old numbering system. However, when Hasbro take over in 1996 they seem to start again from scratch, picking numbers with no real rhyme or reason. For instance, the 1996-97 Premiership range uses 63131-63152, except where a team hasn't changed its kit from the year before, in which case it keeps the old number (i.e. Wimbledon remain at 63749). However, newly promoted Derby and Sunderland are 63026 and 63027 for some reason. The new numbers are also used for a small range of French sides (63153-59), a German range (63167-72), a couple of national sides, and the 1997-98 Premiership kits (between 63317 and 63339). The 2001 range of ten teams reused the last number issued for each team, except for Man City who were still in the old range, and so found themselves at 63341. The Scudetto is a badge worn by an Italian team to identify the Serie A Championship winners of the previous year. For example, Sampdoria won Serie A in 1990/91 so were entitled to wear the badge the following year. These badges sometimes appear in the English Subbuteo catalogues (eg AC Milan and Napoli). Oddly, it is frequent winners Juventus who seem the hardest to obtain in a Scudetto kit. Example 9: Six proud Scudetto winners - Roma, Verona, Napoli, AC Milan, Inter Milan, Sampdoria. Also produced with Scudettos were Roma 2nd (ref 502) and Verona 2nd (ref 616), Juventus (579) and Juventus 2nd (577).